I love something on my front door to set the mood for a Fourth of July party. Here’s a great-looking wreath that costs just a couple of dollars. Cheap chic at its best! Use a wreath form from the craft store or get a length of foam pipe insulation at the hardware store for about a dollar. Duct tape the ends together to make a wreath form. You can buy cheap yarn in the three colors. You can make it as shown or make 13 stripes to be more like the American flag. You won’t use much of it, but it makes great “ribbon” for tying gifts that will be mailed or could have a bow crushed during a road trip. It makes for very inexpensive gift tie and works with many occasions. Hot glue white buttons (you do save buttons, right?) on for the stars or cut out stars from white poster board to glue on. Love it! I found this great project at The Cellar Door Stories. 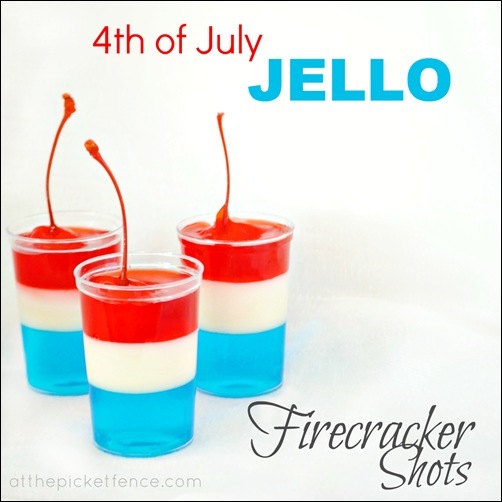 Who wouldn’t love a red, white, and blue jello shot with a fresh Bing cherry inside? Cherries are in the grocery stores already and I love ’em! Remove the seed from the bottom. Or else use marischino cherries from a jar. You can make these jello shots with alcohol or not. Enjoy your jello shots responsibly. Click here for directions At the Picket Fence where she calls them Firecracker Shots. Best/easiest way to cook corn on the cob for a crowd? Cooler Corn! You put the cleaned corn in a large cooler and pour boiling water over them. Use a teapot or something with a spout to pour the hot water in so you don’t burn yourself. It’s also great to free up your grill for other things. Click here for the easy directions at Bon Appetit. A great table centerpiece is also easy–I’ve used it and loved it. Just take a red geranium plant (real or silk) and push 2 or 3 American flags into the pot. It always looks great and you can keep the geranium on your front step all summer. Save the flags for next year too. Easiest themed dessert? 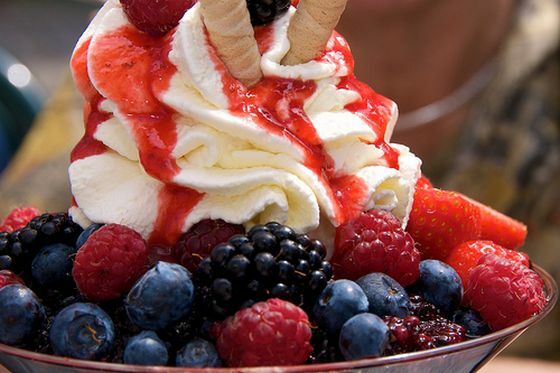 Strawberries and blueberries on vanilla ice cream. Everybody loves this American Flag Sundae. To save time scooping ice cream on the day of the party, try this trick. Scoop the ice cream ahead of time into cupcake papers in a muffin pan and put it in the freezer. Just peel off the cupcake liner when it’s time to make the sundaes. Be sure to slice the strawberries the day before and add some sugar. That way they will develop their own strawberry syrup (see photo) that looks so pretty drizzled over the ice cream and makes the “stripes..” Keep the washed and drained blueberries separate to add to each sundae at the last minute to keep their blue color showing. When we are having a crowd, we ask some of the guests to bring some large coolers. It works well to put cans of soda pop in one cooler with ice and to put the beer and ice in another cooler. Tape a sign on the lid of each cooler so people can help themselves. Last tip: if you will be giving sparklers to children of a certain age, consider using a plastic cup hand protector. So simple and it makes the child’s experience much better. Who wants to deal with burns on the 4th of July? (Keep a first aid kit nearby just in case.) I found this tip at I Love to Dream Do You? Have a safe and fun Fourth! Here’s my 4th of July menu including bacon-wrapped chicken kebabs and veggie kebabs. It’s a festive menu that actually is fairly inexpensive. Get out the yard games to be sure they are in working order and to clean them if they need it. Click on the label “outdoor games” below for ideas for new games to make or buy. I’m always in favor of water balloons! Thanks for your comment, Thomas. There’s always next year! Aaahhh I only wished I would have found your site sooner. These would have been great for my birthday especially the jello shots. My wifey would really enjoy that sundae as well. I really like the plastic cup protection for sparklers. When I was growing up we had to were gloves and if you were lighting fireworks you need protective eyewear. Great post about fun easy fourth of july party..